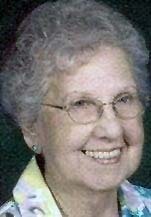 Maxine Winder Baker, 89, of Waverly died Friday evening, Sept 12, 2012 at the Waverly Health Center. She was born June 1, 1923 in Waterloo the daughter of Dewey W. and Gena K. Purkapile Winder. She married Clele R. Baker on February 20, 1942 in Waterloo. He preceded her in death on January 28, 2008. Maxine was a Charter Member of the AMVETS Post 79 Auxiliary. She is survived by 2 sons, David W. (Donna) Baker of Woodbury, MN., John D. (Coleen) Baker of Waverly; 2 daughters, Nancy Baker of Minneapolis, MN, Margaret Baker (Charles) Roberts of Newport, R.I.; 1 brother, Bill D. (Ardella) Winder of Waterloo; 7 grandchildren and 6 great grandchildren. Memorial services will be Monday, Oct 8, at 11:00 A.M. at Trinity United Methodist Church in Waverly, with inurnment in Harlington Cemetery. Friends may call at the Church from 3 – 5 P.M. Sunday, Oct 7. Those who wish may direct memorials to the Church or the family. Kearns, Huisman-Schumacher Chapel in Waterloo is in charge of arrangements.